TenguLife: The curious guide to Japan: So just who was Mamoru Shigemitsu? Foreign Minister Mamoru Shigemitsu isn't a name that springs to mind when thinking about the giants of Japanese politics. But he didn't do too badly. A lawyer by training he was a career diplomat before becoming a politician in the post war years. He resolved disagreements with Russia, which then repaid the favour by having him tried and convicted at the Tokyo War Crimes Tribunals in 1946. This was in spite of representations by senior American diplomats, and indeed, the Chief Prosecutor, Joseph Keenan himself, and he was to spend his time until 1950 behind bars for his deeds. He never became Prime Minister although he did form and lead a small, and not very successful, party in the mid-1950's. He was Ambassador to both UK and the Soviet Union before the war and was a rare voice speaking out against the rise of the military command structure in the 1930's for which he was sidelined during the period of the conflict. The press referred to him as "Shiggy" as he argued, unsuccessfully, against the Tri-partitie Pact, something he saw as an ill-considered step on the inevitable road to war. He didn't become a movie star, wasn't rich and in 1957 died quietly at his home in Yugawara, an hour's drive along the coast from Tokyo. Over all he didn't live a very exciting life apart from two events that mark him out in history. Firstly, he was the ranking diplomat at the United Nations where he represented Japan in its application for membership. 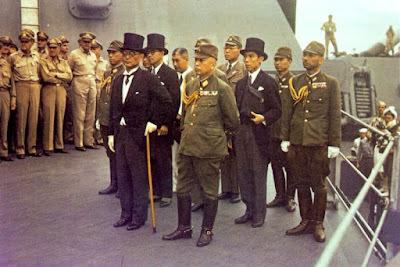 But the second reason he'll be remembered is that he was the little man in a top hat and glasses, walking with a limp, resting on a cane, who boarded the USS Missouri 2 September 1945 and signed the Japanese surrender. And that's probably something he could tell the grandchildren about.